January 31, 2014 - No Comments! For the last eight months my wife and I have fallen asleep each night to the sound of our bathroom toilet emptying slowly and filling again. It’s amazing how a toilet bowl acts as an amplifier for sound, and how much sound can come from a slow, steady drip. The only reason I didn’t repair it eight months ago, was because I falsely believed it would mean I would have to replace the whole toilet, which would entail ripping up most of our bathroom. That was a project I wasn’t financially or emotionally ready to dive into. I am increasingly convinced that one of the fundamental issues beneath many of the conflicts in worship ministry (and the church at large) is that we all frequently respond with surprise when things get difficult relationally. Despite what we know about ourselves (that we have mixed motives for everything), what we know about humanity (that we are born with brokenness), and what we know about sanctification (it’s a crawl on a good day)1, we still are shocked when conflict arises or a ministry relationship goes sideways. You may have noticed that we musicians and artists can be a unreliable, self-absorbed, and sensitive bunch. This makes good soil for an emotional outburst or a sharp exchange at your next rehearsal. Some of the best advice I was given heading into marriage was “to keep short accounts.” This means handling conflict as soon as possible in a godly fashion so that it doesn’t have time to fester, and grow into something bigger and heavier. For those that aren’t a pain in the neck like me, prone to stirring the pot just to keep things interesting, you avoid conflict because you believe the lie that if you don’t make eye contact, the problem will grow bored and go away. Bitterness doesn’t wear a watch. It’s content to hang out as long as you give it free rent. Reconciling with a worship volunteer can be hard work that costs some time and emotional energy. That said, you find out what you really believe about the gospel when someone wounds you. 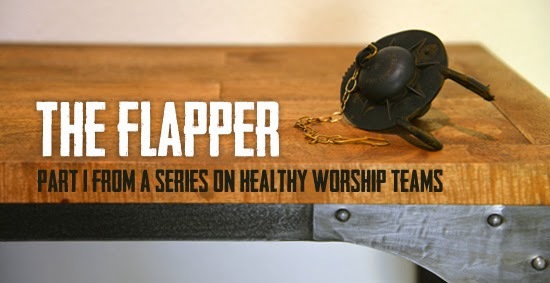 Like any team, you can’t have a healthy worship ministry unless you have a culture of gospel-centered conflict resolution. If you’re the leader, you set the tone for this. Often, the most important thing you do as a leader, is how you treat someone after they blow it. Bottom line: if you do life together on your worship team or band long enough, someone is going to hurt you, upset you, and possibly wound you. What if instead of acting surprised when this happens, we instead were committed to seeing each other in light of the good news we already believe about ourselves? Seek peace.2 Apologize and own it when you misstep or misspeak. Don’t let thoughts about the worst case scenario arrest you from finding a good time to talk it out. If Jesus really paid for it all, then believe that about yourself and the one you find yourself irritated with or hurt by.3 If you need some time to gather your thoughts and repent of your selfishness then take it…but first commit to talking things out in the near future. Fixing a small rift early always beats crossing a huge chasm later. It’s amazing how doing ministry together acts as an amplifier for our character, and how much damage can be done from a slow, steady drip of unforgiveness. After watching nine seconds of a video on YouTube, I saw that the leak was probably an aging “flapper”. The swap took $7 and two minutes. I am sleeping better, the water bill is lower, and now my only regret is that I didn’t solve this eight months ago. You might sleep better too if you gather the courage to step out and reconcile your conflict today.